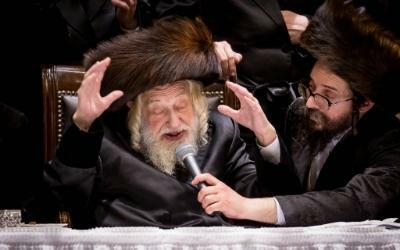 The Skulener Rebbe remains in serious condition and is in need of rachamei Shomayim. In light of the rebbe‘s current health challenges, he was moved before Shabbos to Johns Hopkins Medical Center, the renowned Maryland facility, where he is under the close watch of physicians. The Rebbe, Rav Yisroel Avrohom Portugal, is one of the oldest admorim in the world. He is a son of Rav Eliezer Zusia Portugal zt”l, who founded the Sklulener chassidus, and resides in Boro Park, Brooklyn, where he leads his bais medrash on 54th street, near 13th avenue. As is well known, in 1959 the Communists arrested the previous Rebbe and his son, the present Rebbe, for teaching Torah and for supporting and educating orphans. An international effort to free the previous Rebbe and his son was undertaken, and eventually, through the intervention of United Nations Secretary-General Dag Hammarskjöld, the previous Rebbe and his son were freed and immediately immigrated to the United States in 1960. The Skulener Rebbe continues his father’s holy work by running the Chesed L’Avraham organization to help the needy in Eretz Yisroel. The name for Tehillim is Yisroel Avrohom ben Shainah Rochel.